Hessler X110A. Act of July 22, 1846. $50 Interest Bearing Note. PCGS Currency Choice About New 58. 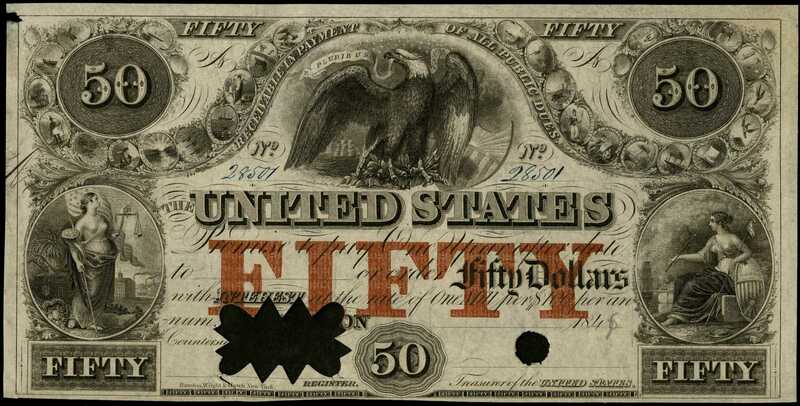 Remainder.Offered is a Rawdon, Wright & Hatch printed $50 Interest Bearing Note issued in accordance with the Act of July 22, 1846. This early federal issue comes on paper watermarked "UNITED STATES" at center. An eagle with a shield is seen at center, clutching a ribbon with the motto E PLURIBUS UNUM in its beak. Justice is in an oval frame at lower left, while Liberty is seated with a capped staff and shield in an oval frame at lower right. Small round vignettes representing various states curve across the note and run above the central vignette. Die counter 50s are at top left and right with FIFTY seen in the bottom corners. Another small 50 die counter is at bottom center. A bold red FIFTY protector is centered near the bottom. The back of the note features branches at center encircling purchase and interest language. Issued notes were redeemable one year from the date of issue at a rate of "One Mill per $100 per annum. "pThis example has been labeled a remainder by PCGS Currency though previously it has been described as a proof. An argument could be made for calling it a specimen though remainder seems the most fitting. In any case this note was likely printed and saved as a cabinet specimen. The serial number panels display serial number 28501 penned in blue ink. A 6 was penciled in on the date line. The note is unsigned and displays a large cut out cancellation in the left signature panel and a punch cancellation in the right signature panel. The back left edge of the note has the year 1846 penciled vertically. ppThe plate impression is exceptional and the note is essentially as an issued note would have appeared save for a full issue date and the Treasury officials signatures. There is a small edge nick at left and minor mounting remnants on the back as mentioned by the grading service. This is the only example of the type we have encountered. Gene Hessler provides a R-8 rarity rating indicating one to three known. These early federal notes have enjoyed renewed interest in recent years as advanced collectors have come to appreciate their importance in the American financial story and their extreme rarity. This note was once part of the John J. Ford Jr. Collection and it now comes with a second important pedigree, that of the Joel R. Anderson Collection.From Stacks sale of the John J. Ford Collection, October 2004, lot 417; Heritage Auctions sale of May 2005, lot 16636.